City Central Library in Ashok Nagar houses over 2 lakhs of books, magazines, and newspapers. It’s a place where readers can study, or enjoy a book not only indoors, but also underneath the many trees on its premises. It's one of the best libraries in Hyderabad. 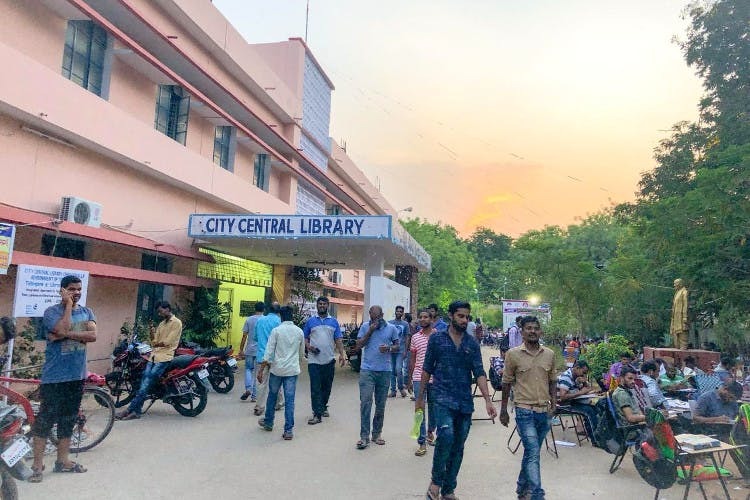 The City Central Library is the biggest library in Hyderabad after the State Central Library with thousands of students and readers walking in every single day. Set up 50 years ago, you might think this place has an old world charm in the architecture or design. Unfortunately, this library hasn’t got any of that, but the rich literature and academic books that you find here brings a crowd to its yard. Enter readers scattered in the open air, and a peaceful vibe all over. Smell the distinct scent of old books as you make your way inside, and find wooden benches, and tables amidst dusty shelves. This public library has multiples sections like the academics, general, periodicals, reference, preservations, and a children’s section too. Spread across two floors, these sections have books of different languages (English, Hindi, Urdu, Marathi, Telugu, Kannada, Sanskrit, and Tamil). In the general section, find ceiling-high shelves with heaps and heaps of books on history, medicine, politics, law, medicine, fiction, non-fiction, and poetry. The periodical section is more like a reading room with newspapers and magazines hoarded in an isolated corner, but don’t if you dig deep enough — you can find leading newspapers that date back to 1964. From Indian Express and Times Of India to Enadu, Sakshi, Hindi Milap, and more regional newspapers, they have a plethora of periodicals the list of which is displayed at the doorstep. They also have a separate reading section for ladies, and the children’s’ section has special furniture and book material that covers academic books as well as novels for the little ones (ages 5-11). The library also has an IT section which has 25 computers with high-speed internet which you can browse for as low as INR 5 an hour. So, whether you’re a scholar or a child, there is something for everyone here. You would be thrilled to know that the City Central Library also has a lecture hall (more of an open auditorium) where dignitaries and experts from various fields often give speeches. This space is strictly meant for non-commercial educational, social and cultural purposes only. Availing membership at this library costs very little. Yes, we’re talking as low as INR 150 (lifetime membership), but you can also borrow books worth INR 150 on that membership for 14 days.